I was sent this book for the Birchbox Book Club. All opinions are mine alone. I love a great personal growth book. Honestly, I was never interested in this genre of books before I turned 30. I don’t know what it was about turning 30, but I got all “improve all the things” on myself. This book came at a really great time. Well… I take that back. It came at a really hectic time. Will and I are emerging from a super SUPER busy time in our lives. He’s been working on the last class in his master’s and studying for the CPA. It’s been a little crazy. I am ready to get back to normal, but it’s been a little difficult. I feel like I need a whole restart on our usual habits, you know what I mean? I dove right into this book when it came in the mail. 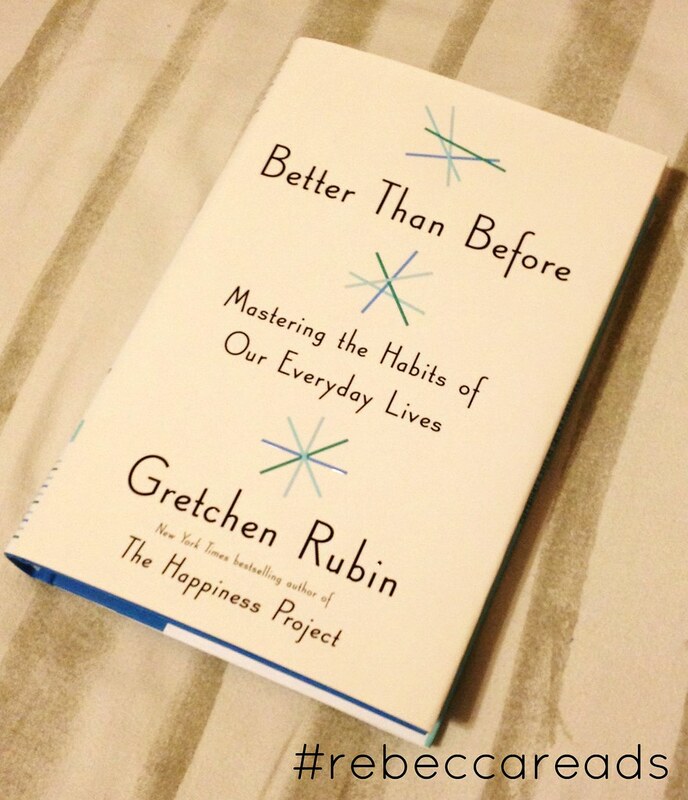 I’d never read a Gretchen Rubin book before, but after reading this one I’ve also purchased The Happiness Project. And I also pre-ordered her Better Than Before Journal. 😉 I have thoroughly enjoyed her writing style. She is definitely a curious person. This book is not only a guideline to develop better habits, but she also documents the process she went through research habits and the formation of habits. My favorite part of the book is that she lists a ton of characteristics in the beginning. Basically, you can go through and select the aspects that pertain to you and keep those in mind as you’re reading the book. There is also a little quiz at the end that is a simplified version of that particular chapter. I actually learned a lot about myself, which was surprising. There are a few things that I will be working on. +I am an obliger. My motivation comes from those around me; in other words, my external influences drive me. This can be a good thing, but it also means that I put others’ projects before my own. Again, not a terrible, but it’s not a good balance. I want to work on this. +I am a lark. Getting up early is best for me, because I work better in the morning. I’ve said before that I have been cursed with being a night owl and a lark, but really I’m just lazy and like to sit around on my laptop all evening. I actually get tired around 9:30-10, but I end up staying way later. Slowly, ever so slowly, I am trying to move back my bed time. +I am a procrastinator. To be honest, I already knew that about myself. However, there was something that Gretchen said that piqued my interest. She said that procrastinators put off their work, but they also can’t enjoy whatever they’re doing. That is so me. Whenever I procrastinate, I do whatever else that I shouldn’t be doing. But, I can’t fully enjoy it because the work I’m avoiding is in the back of my mind. What’s the point of that? Again, something else I want to work on. Now, for a give away! Please use the widget below to enter to win one copy of Better Than Before by Gretchen Rubin.